The first book in the Bride Quartet—following the lives and loves of four friends who run Vows, a wedding-planning company. Wedding photographer Mackensie “Mac” Elliot is most at home behind the camera, but her focus is shattered moments before an important wedding rehearsal when she bumps into the bride-to-be’s brother…an encounter that has them both seeing stars. A stable, safe English teacher, Carter Maguire is definitely not Mac’s type. But a casual fling might be just what she needs to take her mind off bridezillas. Of course, casual flings can turn into something more when you least expect it. And Mac will have to turn to her three best friends—and business partners—to see her way to her own happy ending. I rarely indulge into romantic novels these days but reading this book,I realized why I used to love reading romances. They are just like comfort food. A place to go when you are feeling low . Nora Roberts Vision In White is one such comfort reading book. The girls Parker, Laurel, Emma and Mac are so much fun to read about.Each has a different area of excellence but they blend in to create the most perfect weddings people dream about. 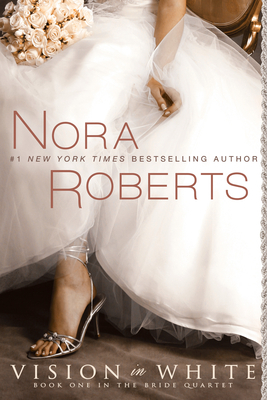 Though this book is about Mac, the wedding photographer and her love life ,you can’t help but fall in love with the world Nora Roberts creates. Friends who not only stand by one another at the time of need but also know when the other one needs you even though it is unspoken request. They are there for each other. The conversations are funny , witty , very contemporary and totally spontaneous. Did I use too many adjectives 🙂 But this book deserves the praise. At a point I felt that Mac’s story could be have been fine focused on a little more. But the book forwards at a good pace and you hardly have time to find faults.The creative , impulsive Mac with a calm and mature Carter suited well for the story.Minor sub plots like Mac and her mother and also the whole wedding planning business were so well merged in this story that nothing jarred at any point. I am speaking for myself here, others might have a different opinion. I would love to know what happens with the rest of the girls and how they get their happy ever after in the coming books. If you need a book to relax and rejuvenate yourself, look no further.